I made this potholder some time ago, and didn’t write down what I did. I thought it was simple enough that I would remember. I was wrong, I did not remember, at least not exactly. And black yarn is devilishly hard to see exactly what is what, so I thought it best to make it again to figure out what I did (excuse for another chicken! ), this time writing it down as I went so I don’t have to go through this again. Medium weight cotton yarn in black, white, red, yellow and turqoise or whatever color you want your flower to be. I used Bernat Handicrafter cotton, because I already have a bunch of that, all I needed to get was the black. All the dc’s are done in the space between clusters of dc’s unless I say otherwise : ) So attach your new color in the space between. Is worked in a circle, and later folded in half. With black, make a sliding loop, or use your favorite method of crocheting in rounds. rnd 1: (continue with black) ch3, 11dc in loop, slpst to top of ch3. Do not end off. rnd 2: (again in black) ch3, dc in sp between the ch3 of the previous rnd and the first st. 2dc in next sp and each sp around. (remember to slpst to the top of the first stitch or ch3, here and evermore) End off. rnd 3: Attach white (remember to do a ch3 or standing stitch, it counts as the first stitch here and forever). 3dc in ea space between clusters, around. End off. rnd 4: Attach black. 3dc in first sp, 4dc in next. Repeat around, end off. rnd 5: Attach white in the space to the right of any 3dc set, ch3 for the first stitch, 2dc in same sp (3dc in the next sp. 3dc between the 2nd and 3rd dc of the 4dc set, 3dc in the next sp) Repeat what is in between the ( ) around. End off. rnd 6: Attach black to the right of any 3dc set that is in the center of a 4dc set from rnd 4. 3dc in same space. 4dc in the next sp, 3dc in the next. (4dc in next sp, 4dc in next sp, 3dc in next) repeat around. Fold in half, continueing with black, sc in each st in the back loops only of the front and back (the inner loops of the sts). Do not end off. Sc in 2nd sc, (skip a stitch, 5 dc in 2nd st, skip a stitch, slpst in 2nd) repeat around. Leaving 6 sts at the end. End off. Attach red in same sp that you ended the black, with a slpst. Skip a st, 5dc in next st, sk a st, slpst in next, sc in next 2 sts. Sc into the top of the folded end, through the sp between dc of the front and back. (Ch5, dc) 7 times, ch5, sc. End off.. Attach yellow in the first red st (the slpst that ends the red 5dc shell), ch 1. Yo, pull up a loop, yo pull through 2 loops on hook. In next st, (yo, pull up a loop, yo, pull through 2 loops) 3 times, in the next st, yo and pull up a loop, yo and pull through 2 loops. Yo and pull through all loops on hook. Ch1, end off. With red, make a sliding loop. Ch3 (counts as first st plus ch1), (hdc, ch1) 5 times. End off. Attach blue with a slpst in any ch1 space, ch2, 3dc, ch2, slpst in same sp. In next ch1 sp (slpst, ch2, 3dc, ch2, slpst). Repeat in each ch1 space around, making 6 petals total. End off, weave in ends. Here it is again, prettified with additional flowers I had laying around…although I think it is darn cute just by itself. It is on the small side, just right for me to use with my pot lids. Very cute! The flowers are the perfect touch! So for a beginner, could you point me to a pattern for the body? I feel like I can add the chicken parts from your guide, but I need more details for the beginning. Thanks! The body pattern is my own, so there is no other to point to that is the same. You could probably use any granny round pattern and adapt it. I am working on a diagram, don’t know if that will help (when it is done). the pattern leaves me in the dark, even tho I have been crocheting awhile…I would love FULL instructions too! I enjoy reading your blog and seeing your lovely projects. I’d like to share an award with you and hope you’ll hop over to my blog for details! Ssssooooo cute! I have lots of roosters in my kitchen, love this!!!! I just finished the chicken and looks great in my kitchen with all my other roosters and such. I’m trying to figure out a way to make one that stands up on it’s own. Thanks for the pattern…. Pat, would you be willing to share the instructions for this chicken? Thanks! This is the cutest idea! I’ve never made a potholder yet, but thank you for inspiration! It’s a neat way to spice up a kitchen and you can get so creative!! Love it! Finished two and am working on a third. There aren’t many patterns for potholders that I like available out there for free or otherwise, so thanks for sharing. Thanks! It is nice to know others like my chicken as much as I do! Love this as I too am chook mad. Will be doing this one asap. I love you’re pattern so mu h I just made two! Thank you! What does this mean? “(Ch5, dc) 7 times, ch5, sc. End off”. I’m to the part of the pattern where I’m making the comb on top of the chickens head. Do I chain 5 then do a double crochet where? “Sc into the top of the folded end, through the sp between dc of the front and back. (Ch5, dc) 7 times, ch5, sc. End off..” All of that is done in the same space you sc into, so yes, you ch5, then dc into the same space the sc was in, ch5 again, dc again into the same sp, and so on. 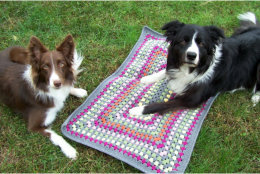 thanks – been looking for that pattern ( or similar) My Mom has one she got at a craft fair so I wanted to make one but need pattern- still new at this crocheting thing! What’s up with the link you have, that isn’t working at the moment (removed)? 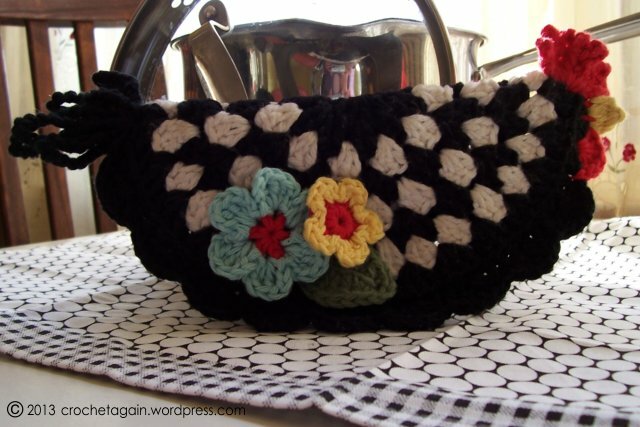 I just made this adorable chicken potholder. Like you, chickens just make me smile for some reason. Anyway, your directions were easy to follow and I am very please with the way my sweet potholder turned out. Thank you! So glad others enjoy my chicken, I had fun making her. Did the chicken potholder in read and light yellow. Came out spectacular. It is not identical since I did not understand the last rows, but so beautiful. Can’t wait to show on facebook. Thanks for sharing the pattern. God bless. Everyone should love chickens, and your chicken is tops with me, Love the size, and colors. Thank you for sharing with us! Forgot to mention that one special little chihuahua calls me mom,and dog hair is part of my life! I just found this pattern and am crazy chicken lady who cannot wait to begin! Thanks for the free pattern. Thanks for posting. I just turned a failed cherry pie potholder into a chicken one. I adore your chicken pattern. It will match my chicken cookie jar. Its so tastefully made. Thx so much for the freebie. A chicken cookie jar?? I don’t have one of those : ) I’ll be looking! Hi there! Just finished up one of these wonderful little chicken yarn delights. I love the color combo you used too! I changed the flower to a slightly different blue and I had some challenges with various steps, and made up my own beak because I was confused, but I faked it til’ I made it work. Ha! Would you mind if I created these to sell in my shop or to a few possible customers? I have a very small biz base. I would of course acknowledge you as the tutorial designer. Thanks so much for sharing. Love this! Sure, you can sell the ones you make! I didn’t see the instructions for the tail feathers? Did I over look them? maybe I am missing something – after row 8 – after folding in half – are the SCs done through both halves? Or is the piece still open in the center? Love this! Just one question: how did you get it to stay upright after it was finished? In the photos, it is leaning against something. In the first one it is a glass jar, and the second it is the lid to the pot. It isn’t able to stand on its own. Yes, you crochet through both sides. There is no opening, it can not be used as a mitt. It is folded in half, so you don’t go around in a circle, you leave the flat edge without the scallops as in the photograph and as in the written directions. 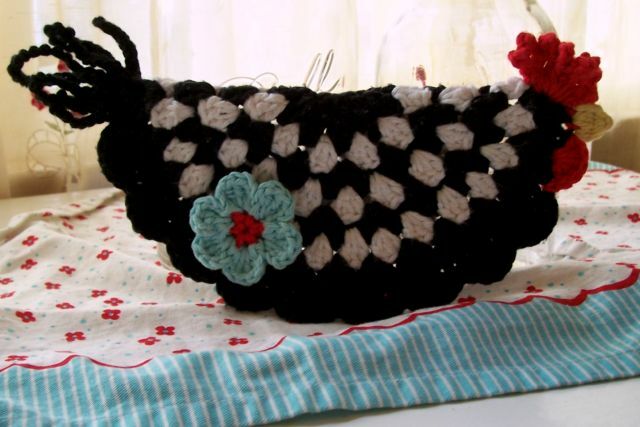 I absolutely love this chook pot holder. My daughter and I love chooks. I am going to make cream and brown ones as we both love brown speckled chooks. You’ve really inspired me. Thanks. love to see your pot holder when it is done, been thinking other colors would be fun!